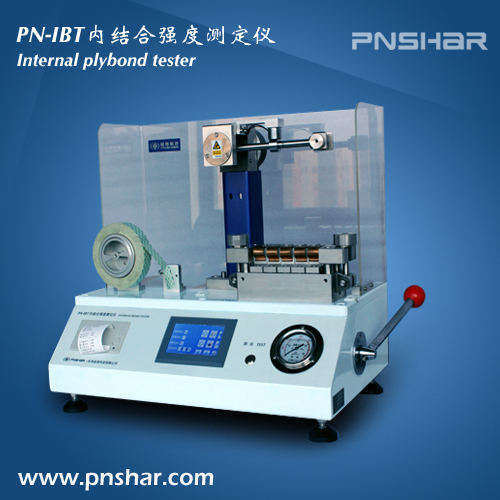 The PN-IBT Internal Bond Tester is designed to determine the internal bond strength of a variety of paper and board materials according to TAPPI T 569. The instrument design is based on a falling pendulum which creates a high speed impact on a paper specimen. The paper specimen is sandwiched between two double-coated tape substrates. The pendulum impact measures the total energy required to delaminate the internal fibers of a specimen in a “Z” type direction into two separate piles. The system also incorporates an automatic sample preparation station which allow five specimens to be accurately prepared simultaneously. With serial port, to connect PNSHAR control software can communicate with PC.